Turn Time — Not My Problem? Turn time is not just a truckers' problem. We're hearing less about it now that the costs are being diffused, but performance is still poor. 2015 12 17 | Graphs revised to reflect November port volume data. Back in July, I characterized turn time at LA/LB as being in the doldrums, rating a D– at best, with the trend lacking a promising prospect of improvement. The METRIS Turn Time Performance Index (TTPI), cast on a scale of 0-100, seemed unable to punch through 40. In the following months it dropped again, and has now returned to 40 for two months straight. The term “doldrums,” it turns out, was apt. Turn Time 2015-11: Not My Problem? Turn Time 2015-06: In the Doldrums? Turn Time 2014-10: Meltdown or Summer Heat? Diagnosing a Port with GPS. Three Easy Remedies. Why is this happening? Haven't the chassis and labor crises of 2014 eased? Earlier this year, the reason appeared to be that container volume was at a record high. That's no longer the case. That's what makes this worrisome. Bill Mongelluzzo at the Journal of Commerce has long speculated about the role of terminal labor hours in understanding turn time, so I'm going to explore that relationship. Before we delve further, let's clarify that the labor statistics readily available in LA/LB are for all terminals: container and bulk, whereas turn time is measured at container terminals only. Nonetheless, the patterns that emerge are illuminating. 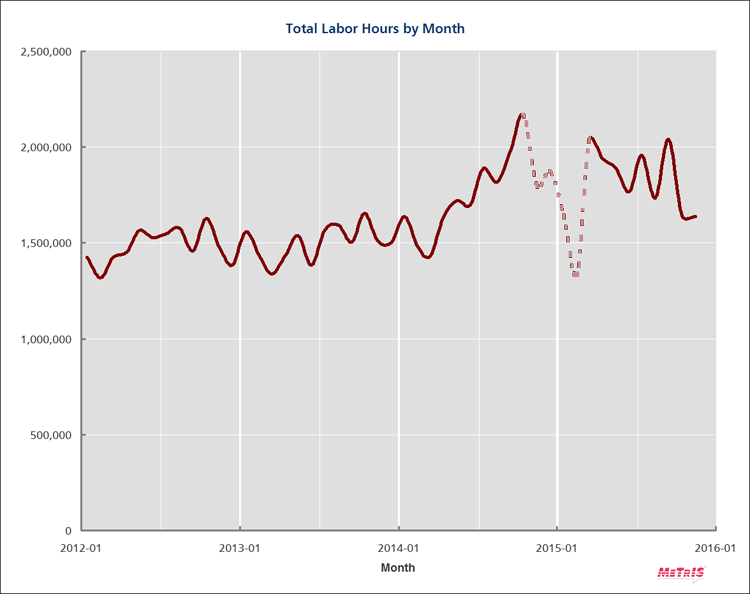 First let's look at labor hours over the past 4 years (Figure 1). In 2012 and 2013 they were in the range of 1.5 million hours each month. In 2014 they climbed sharply to a peak of 2.2m, a 50% increase. They've retreated a little, to the 1.8m range now. (This deliberately ignores the period of intense volatility in the thick of the 2014-2015 labor slowdown.) Bottom line: there's been 20% more labor deployed through most of 2015 than in 2013. Might this be due to container volume? Figure 1. Labor hours by month. The period of high volatility, associated with labor slowdowns in winter 2014-2015, distracts from the general trend, so it's de-emphasized. Source: Pacific Maritime Association. Next let's look briefly at the METRIS TTPI and container volume (Figure 2 below). Given that TTPI was in the 60-range in 2010, and 40 now being the top score for the past 18 months, alarms should be sounding. Rising and fluctuating volume have something to do with it, but effective capacity appears diminished, even compared with early 2014. Figure 2. METRIS TTPI and container volume. In the past 18 months the TTPI has not cleared 40, which is just lower than the performance level observed in the aftermath of the clerks' strike in 2012. Source: METRIS, POLA, POLB. 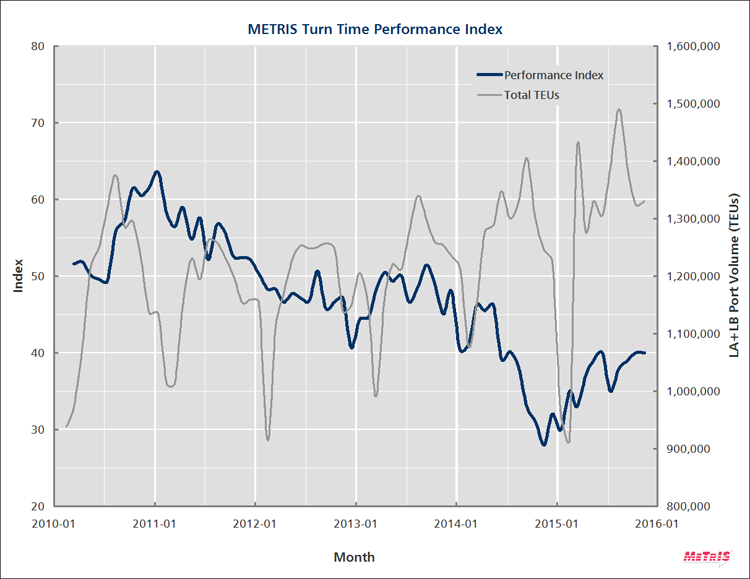 METRIS performance ratings are a commentary not on terminals alone, but on the freight system as a whole. Factors that impact turn time include policy legislation, demurrage and fees, equipment hoarding, truck dispatching and early queuing, terminal management and longshore operations, among others. The TTPI expresses performance rather than delay: i.e. a high score is good. But in the case of raw turn time and labor hours, it's low numbers that indicate good productivity. So in Figure 3, we invert the TTPI to be directionally consistent with the labor metric. And we superimpose labor hours per TEU. Voila! They're practically twins. It's interesting that the blue curve is sourced from GPS instruments and analysis; the brown curve from two independent sources: labor and container statistics. And there's only a rudimentary attempt to match the scales on the axes. This is an unexpected, spectacular correspondence. Figure 3. 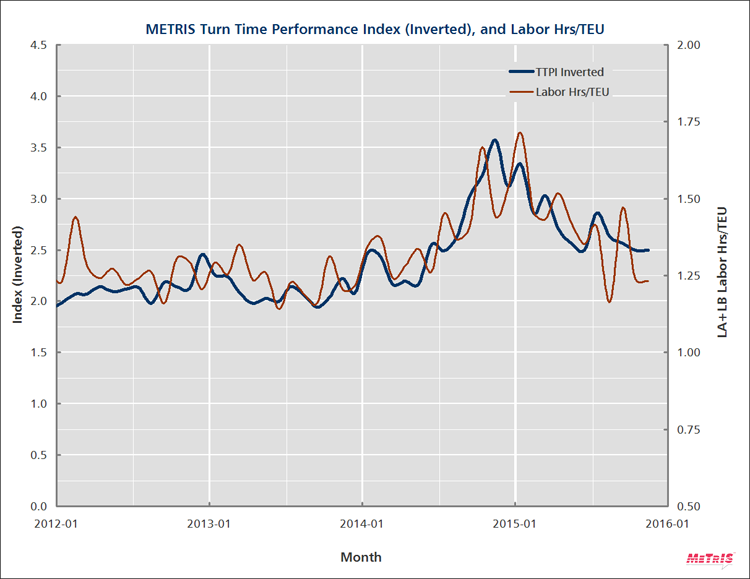 Inverted TTPI and labor hours per TEU. Source: METRIS, PMA, POLA, POLB. Let's be clear about what Figure 3 does not say. It does not say that for every dollar that motor carriers lose in turn time, MTOs lose a dollar in labor. It could be $1.50 on the dollar, or $0.50. As for what it does say, it reminds me of that raucous scene in the movie Oklahoma, “the farmer and the cowman should be friends,” where the two communities alternately brawl and proclaim their bond as “territory folk.” Motor carriers and MTOs are indeed territory folk, and Figure 3 argues that regardless of their obligatory brawls, they should be friends. Turn time is a pain they share, more than they know. METRIS analysis and consulting help MTOs, LMCs, BCOs and ports find clarity and consensus. Increasingly the burden is being borne by BCOs too, who are now paying detention to truckers — certainly those truckers with METRIS service, who can document port delays precisely. Finally, look at the oscillation of the labor curve over the past 4 months. There were wild variations like that during the labor unrest last winter when everything was topsy-turvy, but why are we seeing the same now? It seems as if terminals are breaking free of the high labor costs they've incurred for the past year, and trying to push the pace of recovery. How — or even whether — this is being engineered is not at all clear. In theory it may reflect more efficient operations. Apparently there's pushback from the system, causing the bounce. Since the metric is calculated partly from container volume, which is erratic, it may just reflect the difficulty of hiring the right amount of labor on a daily basis. Difficult to say, but it's worth watching. The broad conclusion is that turn time isn't just a trucking problem; it's an across-the-board barometer of landside port performance, and the costs trickle down to multiple parties. We ignore the decline and stagnation of turn time performance at LA/LB at our peril. The singular vilification of MTOs over turn time inflation is simplistic and wrong. We also know that labor inputs are heading back towards 2013 levels, while truck productivity is not. That latter finding is a concern, and it will take deeper diagnostic analysis of METRIS-spec high-resolution GPS and other data to get to the root of it. This is research that sorely needs to be done. Sponsors wanted. The METRIS data archive, on which this article is based, was possible due to the cooperation and patronage of leading drayage carriers who have been our partners over the past 8 years: Ability/Tri-Modal, California Intermodal Associates, Dependable Highway Express, Fox Transportation, G&D Transportation, Golden State Express, Harbor Division Inc, LA Grain, Port Logistics Group, Price Transfer, Progressive Transportation Services, Southern Counties Express, TK Transport, TTSI and Yamko Truck Lines. 1. Why should we expect much better turn time performance from terminals that have invested many 100's of millions in plant and equipment and even more on the most expensive labor in America? Wouldn't you think their best interests are served by being first, efficient (cost per unit) and then productive (unit/time)? The trade used to think that the best service would get the most business and rates but that changed about 20 years ago. 2. What is driving the need to improve the turn time metric? A shipper buys cargo in Asia, it arrives maybe 14-20 days later and we are having a discussion on improving a truck arrival/departure by 20 minutes. 1. Your first question suggests that turn time rates MTOs alone, and the solution the rest of the world wants to see is more effort/expenditure from MTOs to fix it. Not in my view. Turn time rates the entire port, from legislators to longshoremen. Solutions fall on many shoulders: monitoring, adjusting laws and policies, collaborative tech, etc. 2. The issue isn't 14-20 days, you simply count backwards and plan. The issue is reliability vs uncertainty. It's Day 21, papers are in order, the LMC sends a truck out with an expectation of receiving a box on schedule, but incurs a cost of waiting plus cost of missing a delivery window, missing a train. I don't believe the goal should be to reduce the average by 20 min. The average is absolutely the wrong statistic (HTA doesn't do itself any favors by emphasizing it). The statistics that matter are that today 27% of visits run over 2 hrs - in 2010 that was 12%. And a trucker who has a firm delivery window must now plan on 3 hrs (188 min) for a terminal visit - up from 2 hrs (129 min) in 2010. Again, this is not an accusation against MTOs, it's the port as a system that's losing efficiency and raising costs. The agenda should be to document, diagnose and reduce the frequency of 5h+ incidents, then 4h+, then 3h+, then the average will take care of itself.